Sometimes there are stories that hit close to home, and there is no humor to be found in them. This is one of them. It’s a sad morning in San Diego. San Diego State University students spent last night holding a candle light vigil for their missing friend and fellow student Austin Bice. This morning, they will awake to the sobering news that he’s been found dead in a river in Madrid, Spain. You can read the story here. We commend the efforts of SDSU students who spent hours doing their part, putting up signs and trying to raise money to fund the search team effort in Spain. I can’t even fathom what it must be like for Austin’s parents right now… having to travel to Spain, only to lead a search team to find their child dead in a river. Sometimes life just isn’t fair. I know that people die every minute of every day, but the reality is, we get wrapped up in our own little lives and we carry on without any knowledge of them. Then, sadly, someone we know dies. Even if Austin’s death didn’t hit close to your home, you remember when someone’s death did. Our thoughts and prayers go out to the Bice family and friends. Hopefully this will provide an opportunity for all of us to take a moment and reflect on the things, and specifically, the people, in our lives that mean the most to us. Right now, sports take a back seat to real life…and later on today, hopefully they will provide an opportunity for us to not forget what happened, but rather distract us, and put a smile on our face as we carry on in the midst of tragedy. 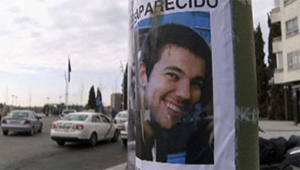 This entry was posted in News and tagged Missing SDSU Student Found Dead in Spain, SDSU. Bookmark the permalink.